Over the years, Eagleson Institute instructors have presented classes in numerous countries around the world. 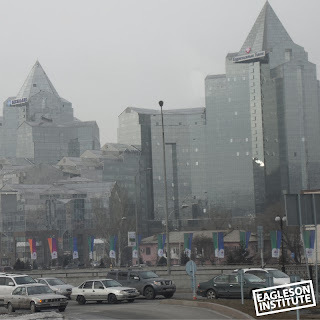 This year found Eagleson teaching teams traveling to “FSU’s” (former Soviet Union countries) Ajerbaijan and Kazakhstan as well as Vladimir, Russia. 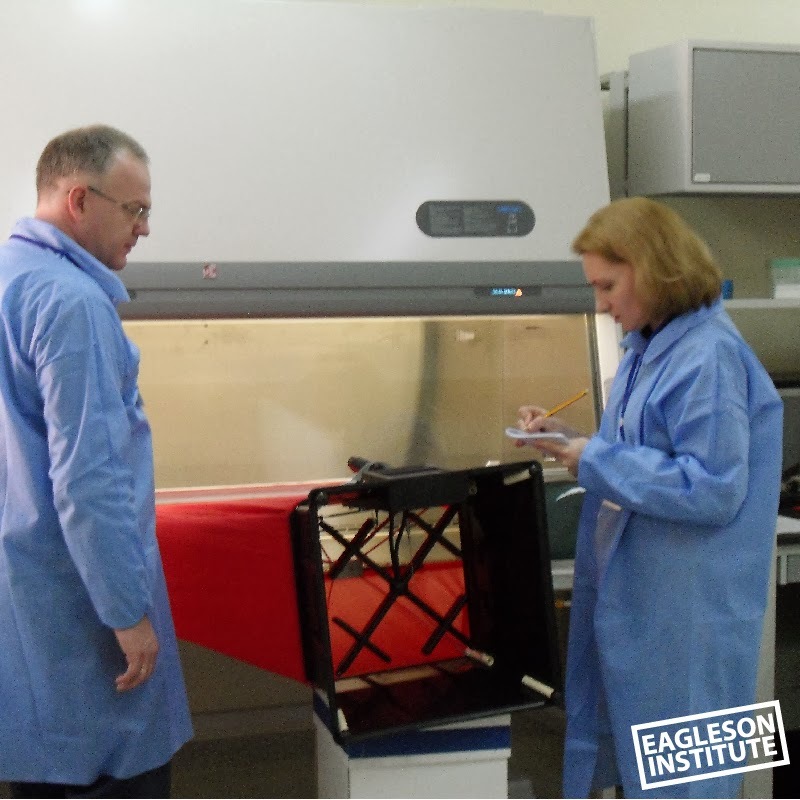 This January found Eagleson Institute Program Coordinator Leslie MacKay and instructors Bob Jones and Jim Wagner in Almaty, Kazakhstan, conducting an 8-day training class on biosafety cabinet certification for students in Central Asia. The course was part of a multi-year effort sponsored by the Global Partnership Program to provide a cadre of individuals within former Soviet Union countries who can certify BSCs. Previously, the 15 class members had attended courses at Eagleson Institute in 2008 and 2010. 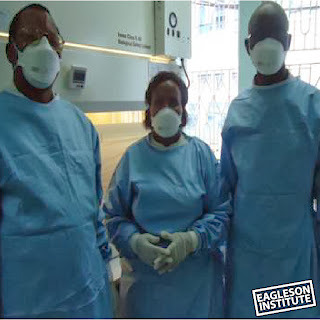 Why does Eagleson travel halfway across the globe to provide training? “Because it’s needed,” says Leslie. “The lack of qualified BSC certifiers around the world is an ongoing challenge for many countries, and Eagleson can help in that effort.” She cites the example of Dr. Namazbek Abdykerimov, whom she nominated for an International Federation of Biosafety “IFBA Biosafety Heroes” award. As a result of the training program, Abdykerimov has developed a national program for certification of all BSCs in the Kyrgyz Republic. Prior to his efforts, BSCs throughout the country were neither certified nor in good working order, although Kyrgyz laboratories routinely handle dangerous pathogens including anthrax, plague, brucella and rabies. Despite a lack of resources, Dr. Abdykerimov certifies BSCs throughout the country, teaches users safe and effective BSC operation and is creating a train-the-trainer program to train new certifiers. 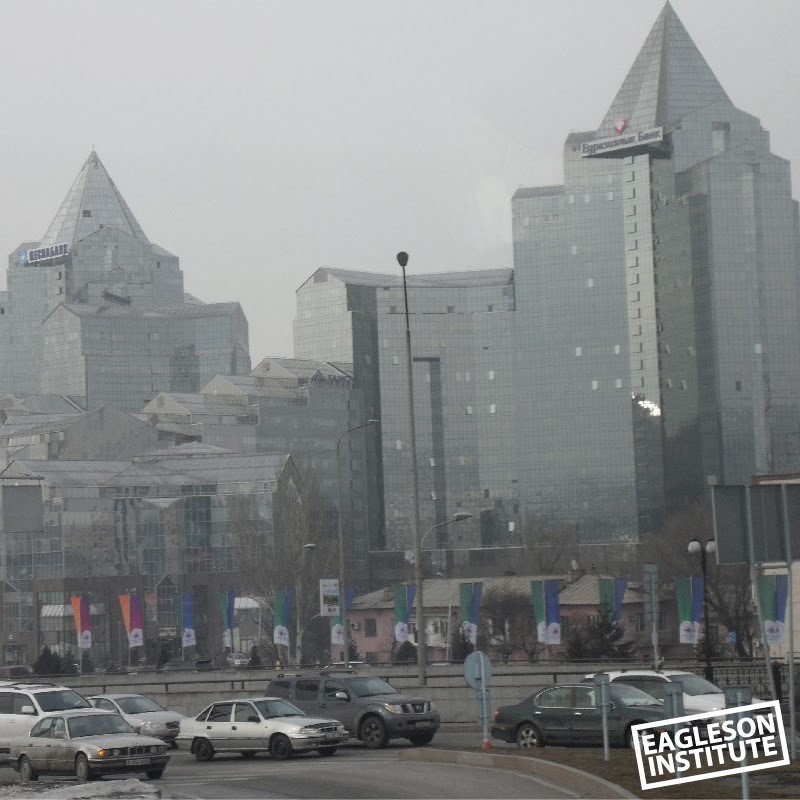 When asked about her most vivid memories of her time in Almaty, Leslie recalls how intensely the class worked over the course of the eight days of classes, the beauty of the city of Almaty, and the warm hospitality shown by their hosts. 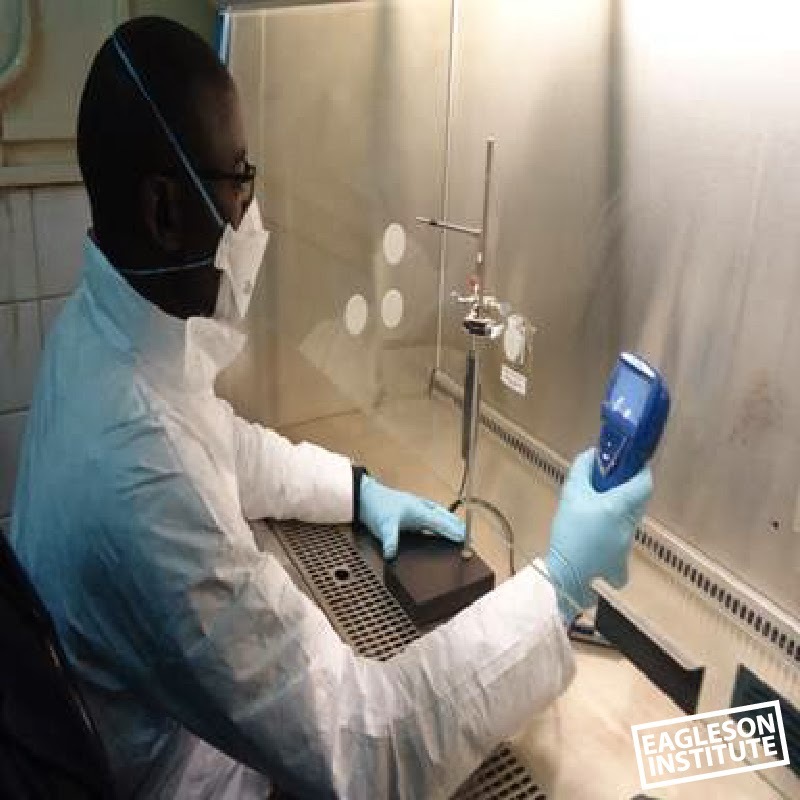 Africans have been trained and mentored by Eagleson Institute instructors as part of an effort by CDC to train Africans to certify biosafety cabinets (BSCs), many of which have been supplied by the CDC as part of the PEPFAR (global AIDS) project. Gabriel Okondo, Senior Engineering Technologist and George Otieno, an engineering technician, who are both associated with the Kenya Medical Research Institute, have been part of that effort. Now, a little more than a year after receiving training at the Institute, the ripple effects of this training can be plainly seen. 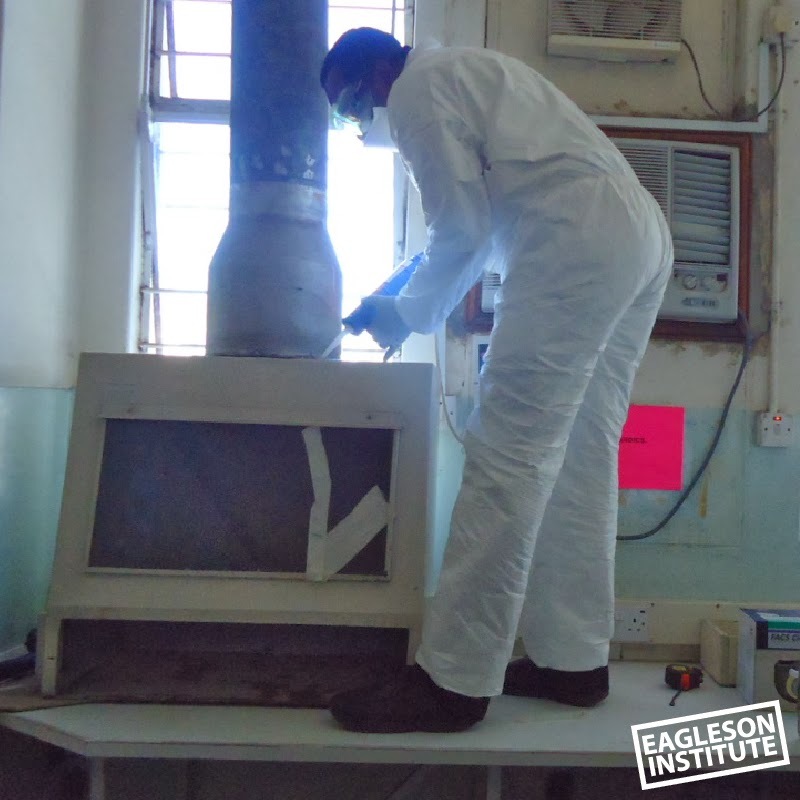 The pair have certified Ministry of Health safety cabinets throughout Kenya and have been asked to train users, QA/QC personnel and biosafety officers in the country, as well as mentor two biomedical engineers from the Ministry of Health on BSC maintenance, repair and certification. In addition, Mr. Otieno has been invited to present a paper at the annual conference of the Association of Medical Engineers. Eagleson Institute interviewed the two via email to find out about the challenges and successes they have experienced. Their responses (and the photos they sent) make fascinating reading for those used to dealing with North American or European labs. EI: After receiving your training at Eagleson Institute, what was your biggest surprise when you started certifying cabinets in the field? GEORGE: I was surprised that within Kenya we had so many biological safety cabinets which had never been certified, serviced or maintained since installation/purchase. (a) In July, arrangements were made for me to go and certify a BSC at the main lab in the Provincial General Hospital (PGH) in Garissa, a town about 500 kilometers (310 miles) from Nairobi, which is where I work and stay. The laminar flow cabinet, which had been used for many years, had apparently never been serviced or certified! It was quite surprising to me how some BSC users did not have knowledge about biosafety and the fact that BSCs need periodic servicing and certification. The top of the BSC where the exhaust filter is located had a lot of dust and all sorts of things placed on the top, including a bottle rack, pipettes, a sample specimen among others. We decontaminated the cabinet and carried out a thorough servicing exercise before certification. (b) At still another time this year, I was asked to certify two BSCs in Mombasa in the Coast PGH lab. One was a normal BSC, which I certified without any problem. However, the other cabinet was really a locally-manufactured kind of hood. It was being used for important TB work, but it had a number of problems. It had a crack in the front view glass which was causing aerosol leakage as well as leakages on the top of the cabinet where the chimney meets the cabinet top, as well as at a joint along the chimney. All these necessitated my sealing them (as shown below) using silicon glue after identifying the leakage points using smoke pattern test. It turned out that I met a number of such cabinets in the course of my work this year. EI: What is the most unusual situation you have encountered while certifying safety cabinets? GEORGE: Laboratory users could start using the BSCs just after decontamination but before certification. This forced us to re-decontaminate the cabinets, which was time consuming. GABRIEL: I reckon that the most unusual and challenging situation encountered thus far was in August this year in Garissa PGH. We were in the process of installing and certifying some 9 new BSCs in the Eastern Region of the country. One cabinet’s inflow and down flow velocities were way out of range at 78FPM and 56FPM respectively. After carrying out calibration, we obtained final acceptable values of 104FPM and 64FPM respectively. The smoke pattern tests were okay. However, when we carried out the filter leak tests, we found a serious filter leakage. Ordinarily, the allowable leakage is below 0.01%. However in this case, it was varying from 0.36 to 33! We believe that the cause of the exhaust filter failure was most probably as a result of the filter being damaged through handling in the course of shipping or transportation. This particular BSC was installed at the TB Lab of the hospital. The only other cabinet in the lab was a locally made hood-type, which was faulty. We therefore made a decision to seal the leakage with silicone glue in order for it to be used for the TB work. As if this was not enough, we had to install the BSC on top of a stone bench or shelf in the lab as shown below. The reason for this was because the metallic stand upon which we were supposed to install the BSC was not available. The other unusual part of this work was that though we had communicated about our plans and dates for the BSC installation and certification, the lab was not ready. The lab door where the BSC was to be installed was too small. However, we found an understanding acting Medical Superintendent who was able to deliberate with us and her staff and the decision was made to create a new double door through an existing window, through which we were able to get the BSC into the lab as shown below. EI: What is your greatest challenge as a certifier working in Kenya? GEORGE: Re-calibration of certification equipments remain a challenge as we have no calibration centers nearby and given that most of our Kenyan laboratories are undergoing WHO accreditation, it is a requirement that the equipments get calibrated. In June, we were certifying the BSC in a lab in Nairobi. We had just deconned the BSC and cleaned it ready for the certification process. We had also appropriately communicated with the lab users not to touch that particular BSC until we finished with certifying it. However, one lab user forgot our instructions and used the BSC. This caused us a delay in our work schedule by a whole day as we had to decon the BSC again before certification. A number of times you may go out to certify a BSC, only to find that you have first to service it, clean it and even repair it before the certification process. We have therefore learnt to be prepared to do all these things. In places where there are no power back-up generators, power outages become a problem in that they interrupt a certification process and it ends up taking longer than expected. EI: What is the most rewarding aspect of your work? GEORGE: Well, I look so special with knowledge that so many don’t have. This has earned me a lot of respect and developed more friends within the country. GABRIEL: The most rewarding aspect of my work is the satisfaction of knowing that people in and around the labs whose BSCs I certify are safe, and that BSC users are getting correct and reliable results in either the lab tests or research work they do. EI: What tasks are most often being performed in the safety cabinets you certify? GEORGE: Different activities, but mostly running TB samples. GABRIEL: The tasks being performed most often in the BSCs are TB lab tests, HIV tests, blood (Hematology) tests, microbiology and cell culture. EI: What has been your greatest success in training users of safety cabinets? GEORGE: Users have shown signs of attitude change on best practices on BSC usage. GABRIEL: In the course of installing and certifying new BSCs, I have trained at least 18 users. In the month of October this year, the National Public Health Laboratory Services (NPHLS) of the Ministries of Health (MOH) in conjunction with CDC organized a Biosafety Training in Machakos Town in which I had opportunity to train about 30 Laboratory Technologists from various hospital laboratories in the country on the use of BSCs. 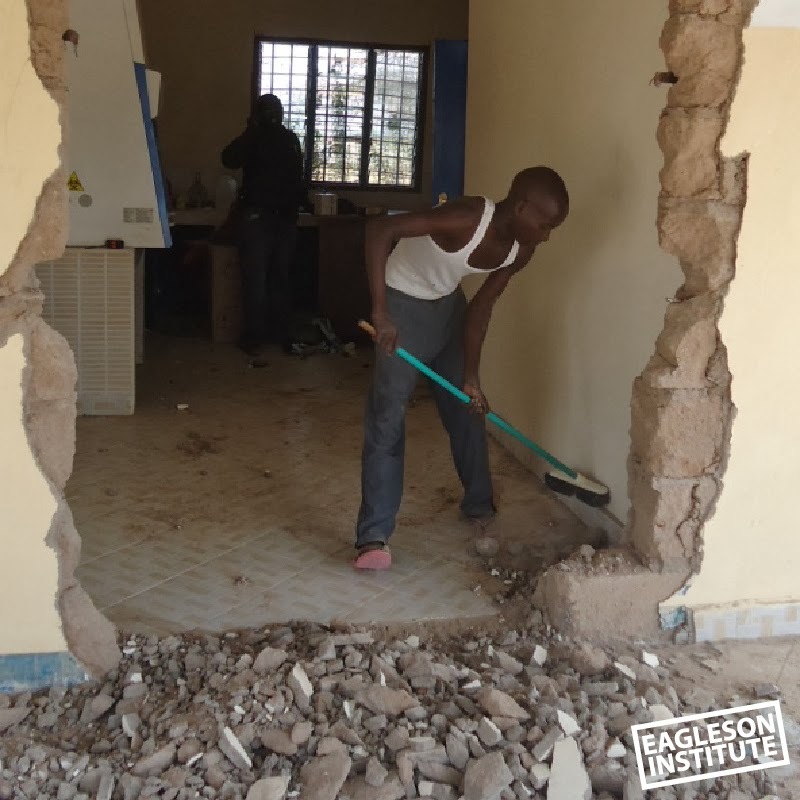 EI: What was your most memorable experience while in training at Eagleson Institute? GEORGE: Actually, almost everything was memorable but more specifically “Fun with Photometers” by Doc. Dave Stuart. GABRIEL: The whole training package at Eagleson was unique and wonderful. Before I came to Eagleson, some concepts about biosafety, HVAC systems and BSCs appeared hard to grasp. However, the trainings of Prof. Dave Stuart, Pam Greenley, Dan Frasier and the other trainers made it so easy to understand. Added to this, the practical aspects about BSC manufacturing and tests conducted jointly with the Baker staff made us have an all-round understanding of BSCs. This is not to forget that the whole training was conducted in a very conducive atmosphere, with the staff of both Eagleson and Baker being very friendly, starting of course with Mary Ann!